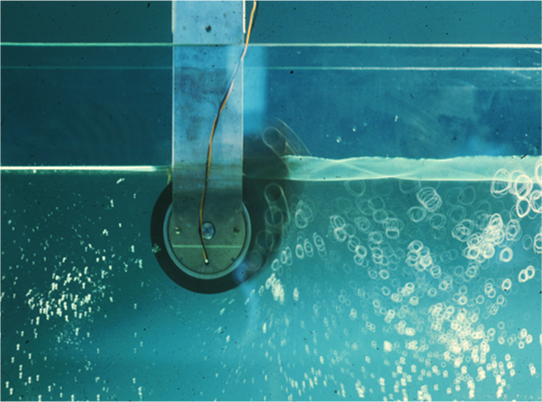 Wave Power Conundrums: Can a photo demonstrate percentage of wave power absorbed? This conundrum puzzled me for a while, so I'd like to share it with you. The question is whether it is possible to determine what percentage of wave power was being absorbed by the Duck in the time lapse photo. This photo has an interesting history behind it: it was presented as proof to the British public (and funding bodies) that the Edinburgh Duck was capable of absorbing 96% of the power in a wave. Yet the story told by this photo is not as simple as it first seems. The flume (narrow tank) was lit from beneath to highlight the water surface and the circular paths of tracer fluid suspended in the water. The incoming sinusoidal wave approached from the right. This time-lapse photo captured one wave period. Professor Salter calls the particle traces 'hands of a clock'. The traces that don't quite join up show us that the hand has been around the clock exactly once. What waves does this photo show? Look away now if you'd like a shot at this conundrum yourself, or want to play 'spot the errors' in my first attempts at solving it! The solution I'm presently most happy with is below. The transmitted wave: some of the incident wave is transmitted under the duck, and continues moving from the duck to the left. The reflected wave: in this 2D case, the reflected wave moves from the duck back towards the wavemakers. The radiated waves: these are caused by an immersed body's motion. In the photo , the blur of the duck shows it is pitching; there is no blur indicating heave or surge. The pitch motion shown in this photo causes radiation of a big wave from the 'beak' (towards the right) and a small wave from the rounded side (towards the left). This way of decomposing waves is no mathematical trick; all these waves physically exist, no matter how non-linear the example. So, here comes the mathematical trick: if we consider the waves and motions to be linear, then we can do a power balance based on the wave amplitudes to find out what proportion of power is being captured by the duck. This power balance is a useful exercise even if the problem were non-linear, as it helps us understand what we are seeing in the photo. We can simplify the problem because we know that two sinusoidal waves moving in the same direction with the same frequency combine to become one wave [http://mathworld.wolfram.com/HarmonicAdditionTheorem.html]. The amplitude of the combined wave depends on the amplitudes of the original waves and their phase difference. Unless the waves are perfectly in phase, the combined wave's amplitude will be less than the sum of the original amplitudes. Does this mean that when two sinusoidal waves travel together, they could carry less power than the sum of the power in the individual waves? It must be so, as power is proportional to the amplitude squared. Of course the remaining power doesn't simply go missing; it goes somewhere else. This concept is key to the physics behind wave energy capture. This simplification leaves us with only two waves travelling away from the duck: the combined transmitted/radiatted wave to the left (amplitude aTR and power PTR); and the combined reflected/radiatted wave to the right, (amplitude aRR and power PRR). The amplitude of the combined transmitted/radiatted wave (aTR) is straightforward to measure off the photo. It is half the height of the envelope to the left of the duck (ignoring the meniscus). The wave envelope to the right of the duck is a bit trickier: it shows the interaction between the incident wave (right to left) and the combined reflected/radiatted wave (left to right). The highest parts of the envelope (nodes) are caused by constructive interference (amplitude = aI + aRR), while the lowest parts of the envelope (antinodes) are caused by destructive interference (amplitude = aI – aRR). The difference between the node and the antinode amplitudes is used to find the combined reflected/radiatted amplitude: (aI + aRR) – (aI-aRR) = 2aRR. The sum of the node and antinode amplitudes is used to find the incident wave amplitude: (aI +aRR) + (aI-aRR) = 2aI. I calculated the proportion of power captured to be: PC/ PI = 91.6%. The original team calculated the proportion of power captured as 96%. The method I've described above is my interpretation of their method. The Duck Efficiency Notes refer to the amplitudes of the reflected and transmitted waves: these are equivalent to what I have pedantically called the combined reflected/radiated and combined transmitted radiated waves. I 've got different numbers because I have included the wave to the left of the duck (transmitted/radiatted) in the power balance. The original team did not include this in their power calculation because they knew what how the thickness of the meniscus would photograph without waves: the thickness of the band to the left of the duck is mostly due to the meniscus. If I exclude this wave in the calculation, I get (aI2 – aRR2)/aI2 = 96.6% , which is pretty close to their number. I hope the reader will not be disappointed that I am presenting results less accurate than the original. My intension was not to improve the original results (that's what journals are for) but to improve the understanding of this problem. I also hope to share the (admittedly highly geeky) fun of having a go for yourself. It could be argued that the waves and motions are a bit too big for the linearity assumption to be true. Related assumptions are that the waves all have the same period, there are no power losses, and the wave power transport is directly proportional to the wave amplitude squared. I've also assumed that I could measure wave height accurately off the glass. It's clear that the meniscus will result in an overestimation of wave amplitude of all waves by a fixed amount, but this photo alone does not give me enough information to estimate this. I also do not know whether wave height varies across the width of the tank. I would be interested to hear whether anyone has compared wave heights measured off glass with those read by wave probes. Furthermore, I should warn that my treatment of the incident and transmitted waves, with latter starting where the former ends, is purely to aid visualisation and description of the problem. From a physics point of view, it is more accurate to consider the uninterrupted incident wave, superimposed with a reflected wave. Part of this reflected wave will travel in the same direction as the incident wave. Destructive interference causes what appears to be a portion of the incident wave to be transmitted. A big thank you to Stephen Salter and Jamie Taylor for helping me with this conundrum. For those of you who want to visualise the nodes and antinodes, here's some [Octave code] (runs fine on Matlab). This is absorbed mechanical energy, right? Not converted into electrical energy, or is it? How is torque controlled on rotation? Is it free to move at all times? What's the internal mechanism like? Is it being driven by a motor or does it drive a generator in this picture? Also, dimensions and mass of the duck has to be precisely adjusted for wave length, and height, in order to get this kind of high efficiency, right? Also, it is not floating, is it? It is held statically in place at all times, right? Seems that way from the picture. What would happen if bracket holding it was allowed to move up and down and back and forth? Would it naturally want to do that? Maybe not. Anyway, fun way to analyze wave energy capture, even if the method wouldn't work that well in an open ocean environment. Besides, while nice to have, who says you need high efficiency for commercial success? If that were true, the internal combustion engine would never have seen the light of day (since Ford originally wanted to introduce electric cars and Otto's engine was originally designed to work entirely on bio-fuels)! The IC engine's efficiency was less than 20% for 100 years and it's still less than 30%, but it's cost of purchase and operation remains pretty low (if one completely ignores its terrible environmental effects). Anyway, the 'best technology' (as far as science is concerned), often isn't the one that becomes commercially successful! Beta tape was much better than VHS! Tesla's fluorescent lighting would have been much more efficient than Edison's (stupid and wasteful) incandescent lighting, but it took us another 100 years to replace that as well. A lot has to do with what the markets "want". For cars it was lots of power and range, as well as how much the technology cost and how long they could last. Also, with wave-energy, you could always gang or stage devices in series, to get more power and energy, if each device is relatively cheap. Getting the most 'energy for the buck' is more important than getting the most energy per device (if the more efficient device is much more expensive, or less reliable)! Don't think we will ever see a device based on the 'duck' generating power in the open ocean. Still, makes a great teaching aid and shows, in theory, how to achieve maximum (coherent) wave attenuation (at a specific wavelength, frequency and height). Not so good with very complex, or random, wave forms, particularly if coming from many different directions. It cannot rectify arbitrary wave patterns - only nice ones (at least I think but correct me if I am wrong about that). The conversion efficiency is with regards to the amount of power extracted from the waves. They had electrical PTO. The electricity generated tallied up with captured mechanical power minus generator efficiency. The internal mechanism was something like a stepper motor that could be driven as either a motor or a generator. It was driven with a demand torque, that had components proportional to the real-time measured rotational position, velocity, and acceleration. The dimensions and mass of the duck did not need to be adjusted for the wave length and height, although you might still have economic optimisations for different wave climates. All the adjustments to take into account different waves were done in the software - the choice of those proportional components. The device is floating. It is not held statically, but it is connected to others like itself in a long line. This experiment simulates one slice. The bracket holding it is allowed to move up and down and back and forth - it is called a pitch/heave/surge rig. Different wave periods give the structure different relative amounts of pitch, heave or surge. Many people believe that a mature wave energy technology might end up looking like the duck - it certainly hasn't been shown that it 'wouldn't work' in a real sea. Only problem with stepper motors is that I don't think they are very efficient for converting mechanical energy into electrical energy. Also, I don't think they make high power stepper motors (for use as generators) because that's not what they are designed to do. Good trick when you have very low rpm's though and want to get 'some' electrical power. Wonder if anyone has tested their efficiency as generators? Will have to look into it. What happened to my other comment(s) about this? What needed to be censored? Sorry; I have to draw the line somewhere. While many of your comments are simply expressing an opinion you are entitled to have, and which I am actually interested to hear about and would love to publish, others have quite unambiguously stepped into the 'troll' category. I have a 'don't feed the trolls' policy. There are plenty of places on the internet where you can anonymously insult individuals and get rewarded with positive feedack; this is not one of them.